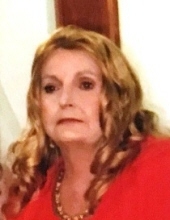 Pamela Kay Robertson of Greensburg, Kentucky, daughter of the late James Randall Robertson and Laveria Tucker Riddle, was born on October 27, 1955 in Green County and departed this life on August 26, 2018 at her home in Greensburg. She was 62 years, nine months, and three days of age. She had made a profession of faith in Christ. Survivors include: one grandson: Lucas Rudenga of Chicago; a sister and a brother-in-law: Tammy and Ronnie Burris of Georgetown; Dylan Burris and Chris Burris both of Georgetown; nieces and nephews: Jennifer and Austin Baker of Georgia, Christina and Richard Deluca of Chicago, Danielle and Jon Curry and Sarah Robertson all of Greensburg, along with a host of other relatives and friends. Ms. Robertson was also preceded in death by: a daughter: Joy Beth Rudenga on June 20, 1999; a brother: James Michael Robertson on January 4, 2018; a nephew: Michael Dale Robertson on November 25, 2002. The funeral services for Pamela Kay Robertson will be conducted at 11:00 A.M., Central time, Monday, September 17, 2018 at the Cowherd and Parrott Funeral Home with burial to follow in the Houk Cemetery. Bro. Jon Curry officiating. Visitation is requested after 9 A.M. , Central Time Monday at the Cowherd and Parrott Funeral Home until time of the funeral service. The family has asked that expressions of sympathy take the form of donations to the family burial fund, which can be made at the funeral home. To plant a tree in memory of Pamela Kay Robertson, please visit our Tribute Store. "Email Address" would like to share the life celebration of Pamela Kay Robertson. Click on the "link" to go to share a favorite memory or leave a condolence message for the family.